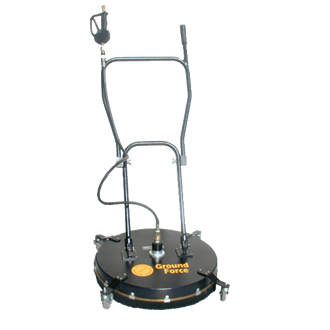 The 20 inch Whirlee Blast’r blasts out up to 4000 PSI and up to 6 GPM to clean up to 200 sq. feet per minute. The rotary action creates a tornado of cleaning power! The Rugged 20″ All Aluminum Deck Skims the surface of the floor on four 1″ casters reduces ” Back Spray” for operator comfort and help to eliminate “Zebra Striping”. The tubular steel handlebars have a built in pressure washer gun for extra durability and ease of use.